Just when you thought that most smartphones have already been unveiled at MWC 2018 and the leaks have come to a standstill, the well-known tipster Evan Blass is back with a much-awaited leak. And you cannot miss this one as it’s about the Huawei P20. Just moments ago, Blass (popularly known as @evleaks) has tweeted a real-life picture of the Huawei P20 and you’re in for a surprise. The Chinese giant is the next major hardware maker in line to be cloning the Apple iPhone X’s notch and camera design. Huawei, as you can see in the image attached below, has not just copied (but trimmed) the notch at the top of the display but also the vertical dual camera setup on the rear. This has helped the device achieve quite a clean look, with a taller and modern 18:9 screen that has smaller bezels on all sides – except the bottom that houses the fingerprint scanner. This is a baffling design choice to be honest. The notch features two cut-outs, though we are not sure what these hide besides at least one selfie camera. Other tidbits of info that you notice in the image above are that the P20 will be running Android 8.0 Oreo out of the box. There is the word “Shirley” written at the bottom right on the back, so we’re going with that as a codename. But wait, weren’t we excitedly waiting to see a triple camera setup on the rear. That was supposed to be the USP of this device and was also teased in the invitation of the launch, which is scheduled for March 27 in Paris. Keep reading to know more about it. Well, our dreams for the triple camera system are not dead. When inquired by a follower about the said setup being hosted by the Huawei P20’s big brother, the P20 Plus, evleaks replied with a simple yes. His word alone is enough to confirm that it’d be the case, since Blass is generally never wrong. 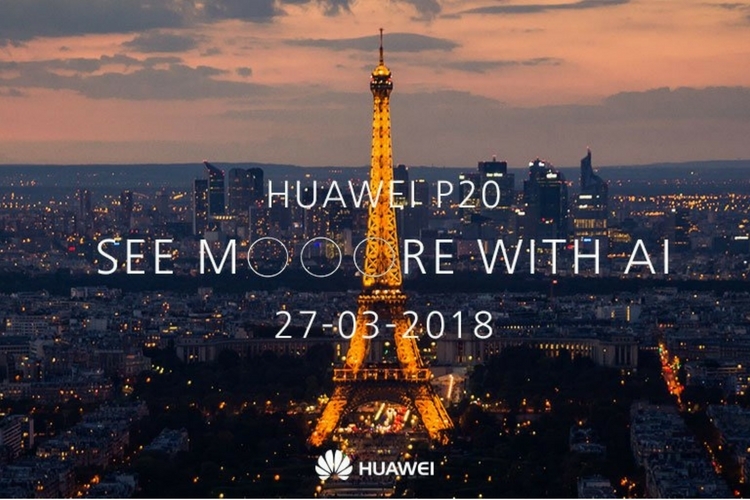 So, now we know that Huawei will launch the P20, P20 Plus (with triple vertical cameras system), and P20 Lite at its launch event next month in Paris. We’ve got high hopes from Huawei ever since we saw the Mate 10’s performance and it would be interesting to see how the company has utilized the three cameras. What are your thoughts on the triple cameras? Let us know in the comments below.